The temperature pushed 47 degrees and light showers fell throughout the morning. It was cold. The November chill was creeping in, and winter was coming. The end of the season was near. The lake was relatively small, 148 acres, with a max-depth of 10ft. Stumps, rocks, and weeds scattered throughout the depths. Houses covered most of the western shore and woods surrounded the rest. At times a BassNinja® can become frustrated. He can be hungry, running out of beer, and not have had a single hit all day. It is during these times that the patience, confidence, persistence and knowledge of the BassNinja® will determine the outcome of the day. The following bass is an example of when the BassNinja® refuses to give up, he knows that through examining his surroundings and by fishing the ideal structure, he will be rewarded with a nice bass. It was overcast and light fog flowed in the air. Sitting on my porch overlooking the lake, I sipped my coffee, ate my breakfast, and formulated a game plan. With a couple fishing spots in mind, I quickly finished my oatmeal, blueberries, strawberries, bananas, granola and honey, proceeded to the boat, started her up, and cruised to the first spot in mind. A spot with some weeds. What up mon! I caught this 3 lb. 4 oz. 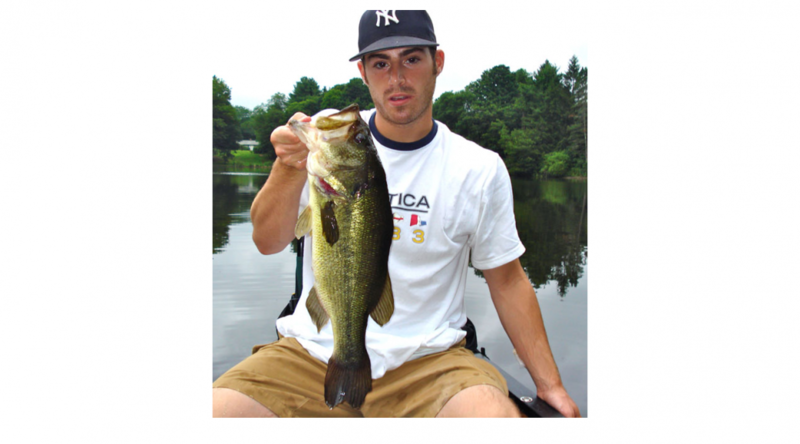 Largemouth in upstate New York. The time was noon, and the sun was high in the sky. This guy hit my bait in shallow water. As you can see, I was close to the shore. My cast was a far one, and a good one at that. I was able to place my bait by a number of large rocks. Kudos to the cast, the Bass hit the bait about 5 seconds after it had landed. I used a black plastic worm about 6 inches long. Overall, the fight was awesome, and an experience to remember. Giddy Up! I woke up in my tent, and I was hungry. Before tackling a long day of fishing, I cooked up some bacon, eggs, and fresh pressed coffee (camping style). I was feeling good because the weather had finally turned for the better. It was a slow morning from the lake we were camping on, so we traveled through a creek to an adjoining lake. When we approached the mouth of the creek, you could see weed beds scattered throughout the lake, and we immediately began to work them in a counter clockwise direction. The shoreline had some residential development; the rest was surrounded by trees. Furthermore, the branches and leaves draped into and above the water, providing great cover for a bass to be chillin’, waiting for my bait.